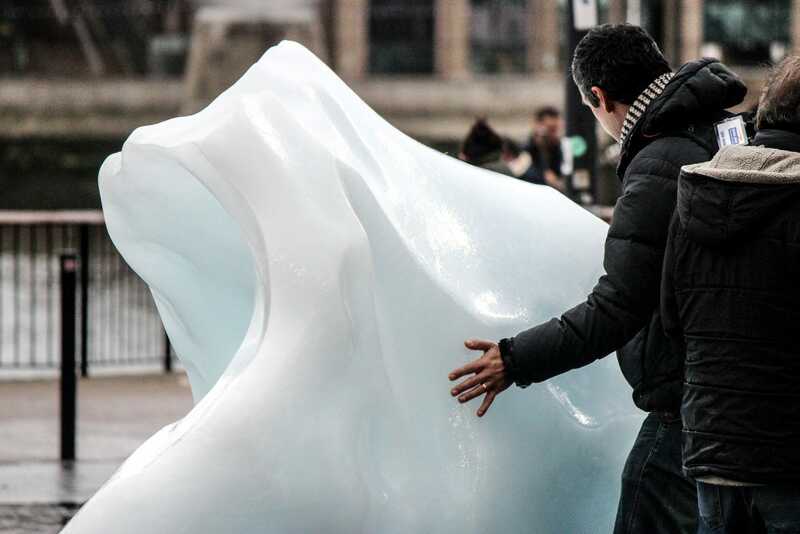 Any Londoners walking past the Tate Modern art gallery this month found it difficult not to stop and stare at a new addition to its courtyard: huge chunks of ice, harvested from the shores of Greenland, had conspicuously materialised. Appearing on 11 December, these 24 icebergs, gleaming with characteristic white-blue brilliance, have been thawing ever since, their meltwater quietly slinking away into the Thames. The project, dubbed “Ice Watch,” is a jarring sight, which is entirely the point. This installation is a visceral microcosm of human-caused climate change, one that puts the urgency of the crisis squarely in the public eye. Olafur Eliasson, an Icelandic-Danish artist based in Berlin, and Minik Rosing, a professor of geology at the Natural History Museum of Denmark, are the project’s designers. Like many, they’ve watched the steady erasure of the Greenland Ice Sheet—the world’s second-largest—with horror. Between 2011 and 2014, Greenland lost a trillion tonnes of ice. In July 2012, almost the entire surface of the ice sheet was melting, an event that was simultaneously unprecedented in the satellite era and a bellwether for what appears to be the new normal. Greenland is haemorrhaging ice, and if the entire sheet were to melt, global sea levels would rise by about 23 feet. Despite these staggering statistics, climate change remains an abstraction to many. “Obviously, we need the data and the science, but it’s so easy to dismiss numbers and even stories as distant from us,” said Eliasson. The pair wondered if something a bit more visceral than facts and figures might do the trick. And so, the two hatched an audacious plan. They would go to Nuup Kangerlua fjord in Greenland, where ice is calving into the sea, and harvest some that was already adrift. This is easier said than done: divers and dock workers on boats would have to essentially fish the icebergs out of the water with ropes, before powerful cranes lifted them up onto land when they approached the shore. They would then ship these blocks–some weighing as much as 6.6 tonnes–in refrigerated containers from Nuuk to London, where 24 of them would be displayed outside the Tate Modern. Six would also be placed outside Bloomberg’s European headquarters in the City of London, a nod to Bloomberg Philanthropies’ support of the endeavour. Similar installations have previously appeared in two other cities. 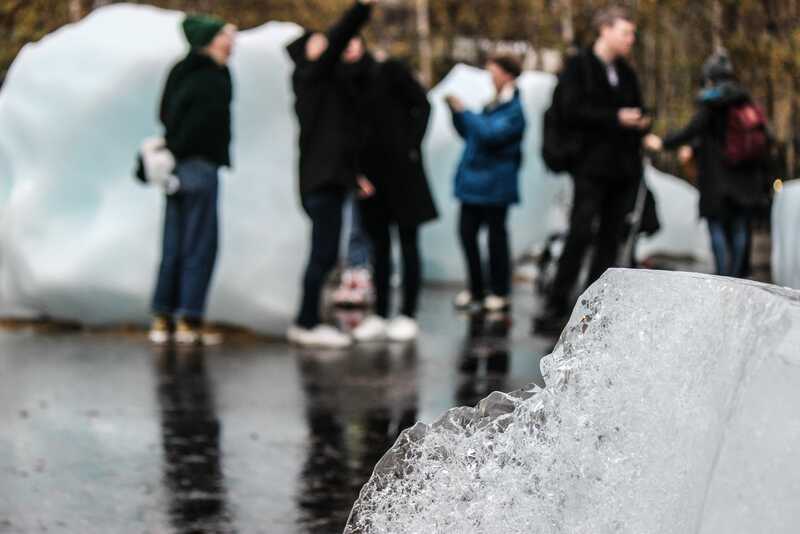 In 2014, Copenhagen was graced with the inaugural Ice Watch installation, which coincided with the publication of the Intergovernmental Panel on Climate Change (IPCC) Fifth Assessment Report. In 2015, ice appeared in Paris alongside the COP21 gathering of world leaders that ultimately led to the Paris Agreement. 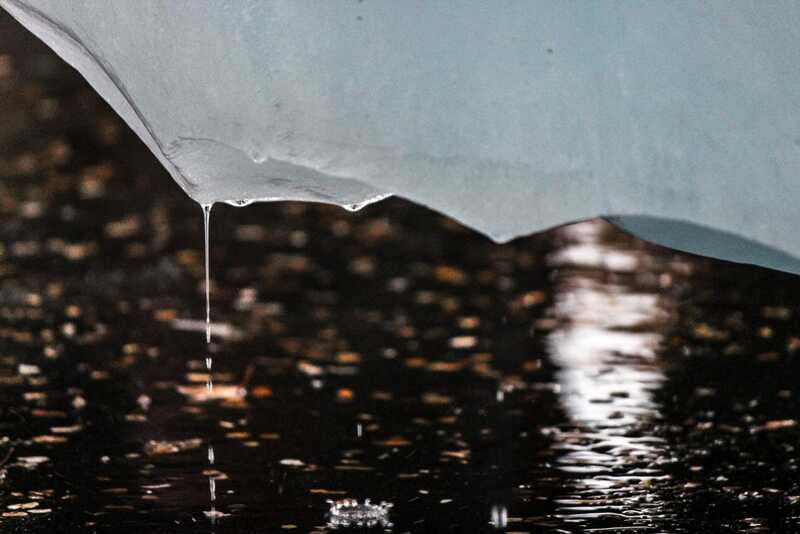 Ice Watch made its London debut on the third anniversary of the Paris accords, and during the same month the COP24 meeting was taking place in Katowice, Poland. It’s free to visit, and anyone can approach the ice and interact with it how they wish—until all the ice melts away. Crowds have been meandering through the eye-catching icebergs day and night for over a week. Some are taking selfies with individual blocks, while others are touching and even tasting the shimmering, chilly masses. It is way of interacting with a part of our world most will never see up close, as well as a tangible snapshot of climate change, presented to a city that largely accepts the science but is often distracted by other matters. The sense of exigency the project exudes may appear, on its face, to emphasise a powerful sense of hopelessness. After all, the public can do nothing to stop these particular blocks of ice melting. Similarly, thanks to the near-daily stream of dire climate change tales appearing in the news, plenty of people feel, understandably, powerless to enact change. Rosing, however, believes the opposite is true. We have only got to this point because our species has the power to change the fabric of the planet so drastically. If we can get ourselves into this mess, then we can surely get ourselves out of it again. Ice Watch aims to inspire that sense of optimism. London’s ice may disappear, but that doesn’t mean Greenland’s remaining cover is consigned to the same fate. Ideally, Eliasson says, by interacting with the thawing ice the public will be reminded that they all have a part to perform in this planetary-scale play. Climate change isn’t isolated to the here and now; it is, of course, multigenerational. With that in mind, it was refreshing to see that there weren’t just adults exploring the exhibit, but children, too. 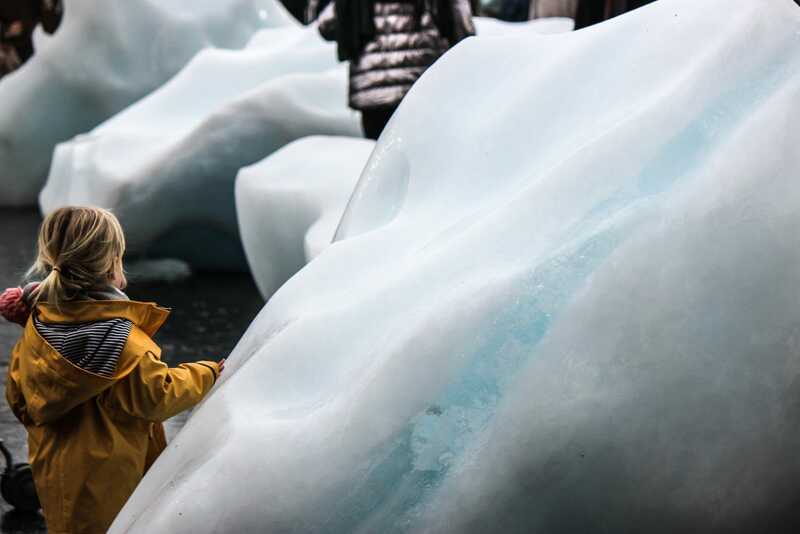 While they gaped at the ice with awe, they could be heard asking their parents about climate change and, in some instances, what they can do to stop it.